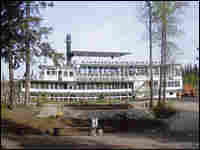 A four-decker on the river: the Riverboat Discovery docked near a forest on the Chena River. 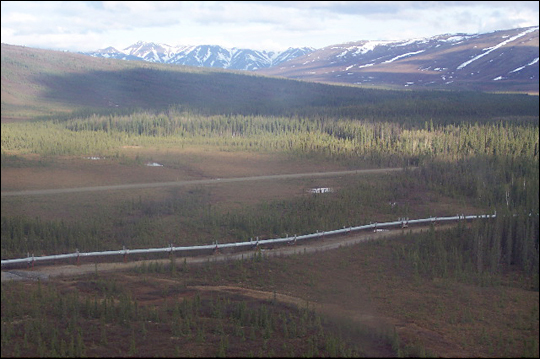 The view of a pipeline seen from the air. Alaska became the 49th American state on Jan. 3, 1959. But the state has already begun celebrations to mark June 30, 1958, when the U.S. Senate passed the Alaska Statehood Act. Use Styrofoam in your outhouse (and if it's blue Styrofoam, it won't get cold). Pay a lot for gas — even though residents say you could stick a straw in the ground and just sip it up. The area's reindeer — Rudolph included — are really domesticated caribou. And in Alaska, there is all manner of wildlife — and all kinds of wildlife stories. Just ask Sally Smith, who spent three terms in the state Legislature and was Juneau's mayor. "One of the better stories is about an eagle in southeast Alaska that had a salmon in his talons," Smith said. "And he took off as an Alaska Airlines jet took off — but he dropped the salmon on the windshield of the jet, cracked the windshield, and they had to make an emergency landing," Smith said. "I can imagine the report: 'We crashed into a fish.'" A few of the eight passengers on a recent flight on a twin-engine Piper Navajo Chieftain plane were nervous. But the ride was smooth, and visibility was good. During the trip, the pilot announced that the plane was crossing the Arctic Circle. But a glance out the window showed the same tree-lined landscape that passengers had seen for the past 10 minutes. After all, there's no dotted line to mark the actual Arctic Circle, just mountains — brown, streaked with occasional snow. But most astonishingly, piercing millions of acres of spruce trees, centuries-old and untouched by human hand, was the silver streak of the trans-Alaska pipeline. 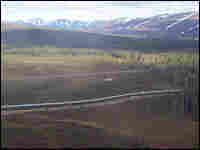 It snakes through the wilderness for 800 miles, from Prudhoe Bay to Valdez. 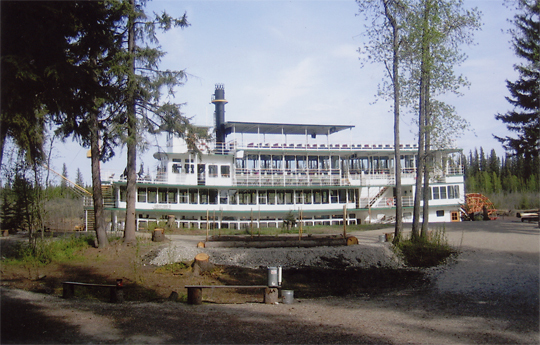 Back in Fairbanks — 100 miles south of the Arctic Circle — captain Ken Kersinger steered the four-decked Riverboat Discovery along the Chena River. Tourists always ask Kersinger how he — or anyone, really — can bear to live in a place that gets so cold for so much of the year. Sometimes, Kersinger says, he wonders, too. The weather is always on their minds in Alaska. At the Fairbanks farmers market, Jodie Gowans says that with just a 90-day growing season, it's too early to see the area's famous giant cabbages. We don't usually put most things into the ground until about June 1, and they're not mature — things like cabbages — until August, some in September," Gowans said. "But by then, we're already getting frost." They grow flowers and vegetables in greenhouses. But Gowans says the cost of heating oil has gone so high that many people are firing up their greenhouses later than usual. On the other side of the market, Betty Bailick is cuddling one of her 21 grandchildren or 7 great-grandchildren. She's selling what appear to be long, flat, flannel-covered serpents. Except they're not. "They're filled with wheat," Bailick says. "And you microwave them and put them on your cold, achy body. Or you can freeze them and use 'em if you need to ice. And I need to ice my neck. So I ice my neck and heat my feet — and somewhere in the middle, I'm happy," she says, laughing. Most of those I met who live in Alaska first went there for a week, or a month, or the summer — and never left. As Sally Smith, the former Juneau mayor, said, "I started out as a desk clerk in a hotel, and this has definitely been the land of opportunity." In addition to her political career, Smith has run several benefit programs. She says there are plenty of places in the United States where you can make a difference. But Alaska, she said, is different. "Because Alaska is a spirit," Smith said. "It's a state of mind. And the spirit is just more prevalent here." Alaskans are individualists. And sometimes they're second-chancers. They don't like to be bothered with rules and other people's restrictions. But in Alaska, among these loners, there's a real sense of community. "We go our own ways; we come together," Smith said. "And there's a sense of — I think maybe of building something. So each of our talents will be pooled with another independent person's talents, and we grow something we couldn't have as individuals." The state of Alaska, population still listed at fewer than 700,000 hardy souls, will be a half-century old come January. It'll be cold, then. And that seems fitting.